If you believe Hollywood stunt coordinators, gas trucks are everywhere and your family sedan's a light tap away from turning into an all-consuming fireball. 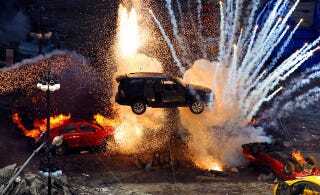 With your help, we've ignited this list of the ten cheesiest fake Hollywood vehicular explosions. What&apos;s The Cheesiest Fake Car Explosion? What Makes It Cheesy: This woman in the brand new NSX decides to make a run at the cops. Unfortunately, she'd just filled up her car with liquid hydrogen. For those of you worried about seeing a primo Acura destroyed, the car fairly obviously transforms into a Pontiac Fiero. Whew. What Makes It Cheesy: It's a rule in Hollywood that any car crash must end in an explosion. Even super low speed crash ones buffered by an insane serial killer. We've got no explanation for what happens next, though. What Makes It Cheesy: This scene works in a "Michael Bay winks at conventional car chases" sort of way. There's both Nicolas Cage and Sean Connery, so you're prepared for it to be delightfully awful. But why does the trolley explode? It's not even electric, it's a cable car. it runs on a cable. What Makes It Cheesy: The Car's already one of the worst car movies ever made. The angry Barris Lincoln Continental Mark III's power to make squad cars explode even before they start to roll down the hill is just the cream cheese icing on the craptacular cake. What Makes It Cheesy: With performances like this, Peter Fonda could have easily been the next Nicolas Cage. There's mostly schlocky 70s car chases and crashes until an F-150 spontaneously combusts at the end of the trailer. Good work, Hotlips. What Makes It Cheesy: Perhaps the issue here isn't the average Bond villains' choice of ride. Maybe everyone in the '60s just wore intensely alcoholic cologne and traveled with large quantities of dynamite in their trunk. It sounds about right for a Bond villain. Also, now we know where Toonces got all its explosion B-roll. What Makes It Cheesy: It's blasphemous, but true. One of the greatest car chases of all time ends with a Velveety explosion when the Charger misses the gas station's tanks by a large margin but still makes them explode. Lore has it that it was too expensive to film again so they just chopped it together in editing. What Makes It Cheesy: Yes, it's Munster cheese, but isn't that the point? In honor of Leslie Nielsen, it would be hard not to mention Lt. Drebin's explosive performance. Remember, sometimes cheese is good for you. What Makes It Cheesy: The music. The acting. The camera work. The Stallone factor. The slow motion, unrealistic explosions. This is a bizarro world where cars all have inverse aerodynamics and instead of alcohol-based fuels they use liquid C2. It's so awful it's kind of beautiful.